STEP IN FOR A VISIT! We have searched far and wide to together what moves us. We travel to seek out the genuine and bring it back to Waxahachie. We represent artwork and artists whom we love and feel best represent Webb Gallery. It's never easy to explain exactly what that is, but a visit to the gallery or on our site should help you out. We are searching out what is amazing and persevering in the human spirit though art and design. That indescribable drive to create and the spirit of make do and excelling in using what you have available is what we are looking for to thread together the common esthetics of art, antiques, people, places, music, literature and objects. 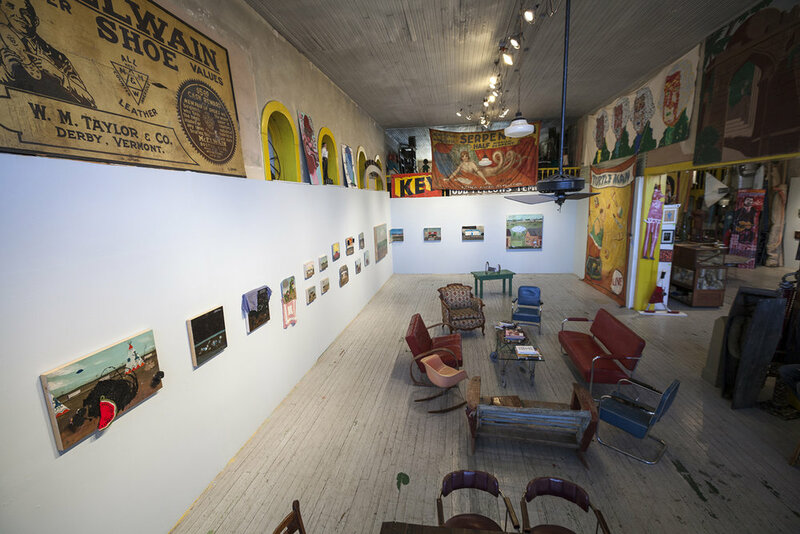 We host 4 or 5 exhibits per year here at Webb Gallery! In addition to exhibits of art we are really excited about, we have a huge and ever-changing inventory of artwork, antiques, books, records, Margaret Sullivan jewelry and a cool t-shirt here and there. Our Webb site is only a small example of what we do. There is no way we can show it all on this site, but have fun looking through, then plan your visit. Art to us can be found in items, places, or people. You are sure to find all examples here at Webb Gallery. We love a good mystery and don't need to have all of the answers. The artwork from the Fraternal lodges and carnival banners are the best examples of beauty of the mysterious kind and we have spent years seeking out those pieces to collect and have in the Webb Gallery inventory. A good photo that tells a story of a piece of artwork that you just wonder how that came about is a Webb gallery standard. We love the venacular that captures a place and time in history is another collection of what fills the Webb. We have an unending affinity for the handmade and the impactful. Art should be accessible by anyone who wants entry into the appreciation for the handmade. Creativity is a gift and the spirit it captures nothing short of a treasure.